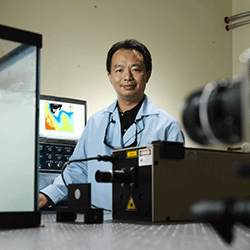 Congratulations to scientist Zhiqun (Daniel) Deng, recipient of PNNL's Exceptional Engineering Achievement Award. Each year, PNNL recognizes one member of their science and engineering staff who has made major contributions with global impact in an engineering field of study. Deng was recognized for his exceptional engineering contributions in aquatic acoustic technologies, establishing PNNL as the world's leading institution in understanding and mitigating environmental impacts of waterpower systems. Deng is active in the development and application of experimental and numerical modeling tools for conventional hydropower and marine and hydrokinetic renewable energy systems. He founded the Bio-Acoustics & Flow Laboratory (BFL), which is internationally accredited for hydrophone calibration and sound source measurements by The American Association for Laboratory Accreditation. Deng has also co-developed many devices and systems such as the Juvenile Salmon Acoustic Telemetry System (JSATS) and the marine mammal alert system. JSATS is a nonproprietary sensing technology deployed system-wide in the lower Columbia River Basin for evaluating the behavior and survival of migrating juvenile salmon and other endangered species. The newly developed transmitter is the first active tag that can be implanted into fish via injection instead of surgery. While reducing the probability of adverse effects from implantation and the physical and biological burden for tagged fish, the injectable tag last 5 times longer than the ones commercially available. The marine mammal alert system supports deployment of marine hydrokinetic energy devices. A banquet to honor Deng and other recipients took place on September 23, 2015. To learn more about injectable tags, read the PNNL news release, visit the JSATS website, or check out the recent publication in Scientific Reports.